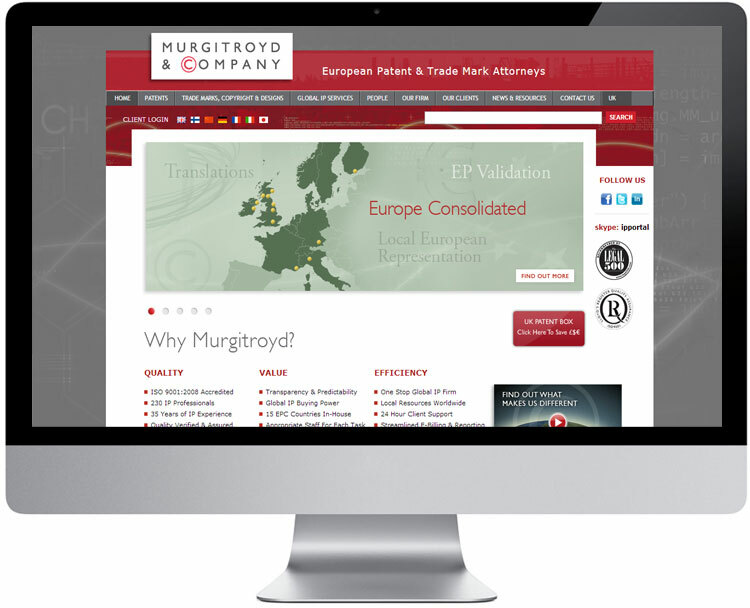 Murgitroyd & Company are European Patent & Trade Mark Attorneys. From one Glasgow office, they now have 13 offices throughout the United Kingdom, Ireland, France, Germany, Finland and Italy providing local and European representation as well as direct representation rights in The Netherlands, Belgium, Norway, Monaco, Switzerland, Sweden, and Denmark along with client liaison offices in the United States. Murgitroyd & Company now ranks among the largest groups of Patent and Trade Mark Attorneys in Europe — with over 75 Patent and Trade Mark Professionals and more than 230 staff. Since we built the website over two years ago, traffic has gone up by 58% and social media activity that lead to direct visits to the website and vice versa has increased by 398%. We have also managed to increase the direct contact enquiries from the website by 295%. The homepage features clear calls to action and provides a visually stimulating insight into who Murgitroyd are and how they can help. We are constantly striving to improve the website and introducing new techniques and technology to improve the functionality and user friendliness of the website. 07/03/2015 • The Apple Watch is here!